1899: Completed by Ailsa Shipbuilding Co Ltd, Troon (Yd.No.79) for Samuel T. Chadwick, Haulfre nr Beaumaris, Anglesey as steam yacht ZISKA. 1900: Sold to Lancashire & Western Sea Fisheries Committee, Preston for £8,250. John P. Muspratt, Preston, County Offices appointed manager. 1901: Fitted out as a Fishery Cruiser and remeasured 145g 59n. 1901: Registered at Preston after fit out as a Fishery Cruiser. 1901 – 1907: Visited Preston on 13 occasions, either from Southport or sea. Frequently coaled and laid over at Fleetwood. 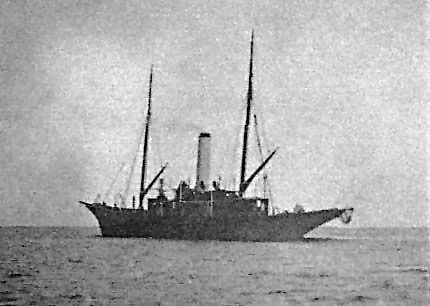 4.1902: Towed the Blackpool long line boat and fishermen north to fish off the Cumberland coast based at Seascale. 1907: Sold to Montague Grahame-White, The Royal Automobile Club, Piccadilly, London & others. Montague Grahame-White designated managing owner. 1909: Refitted as a steam yacht and remeasured 145g 44n. 1910: Registered at Preston as MAJESTA after refitting as a steam yacht. 14.08.1912: At Cowes week and anchored in Cowes Roads, Jack Douglas of Southwick drowned after falling from boat returning to the yacht. 14.08.1913: Sold to the Earl of Morton, Conaglen, Ardgour, Argyllshire. The Earl of Morton designated managing owner. 1927: Sold to James Napier, “The Drums”, Old Kilpatrick, Dumbartonshire. James Napier designated managing owner. 1939: Sold to Arthur Gore, 7th Earl of Arran. 3.1940: Requisitioned for war service employed on harbour defence patrol. Based Sheerness. 29.5.1941: Compulsorily purchased by MoWT. 8.1941: Employed on balloon barrage. 8.1941: Deployed as an auxiliary patrol vessel. Based at Aultbea, Loch Ewe. 4.1943: Used as an accommodation ship at Aultbea. 1.1946: Laid up and offered for sale. 1946: Sold (not traced further at the moment). This entry was posted in uncategorised on July 3, 2015 by Fred Smith.